How high are realtors´ and lawyers´ fees in Bermuda? What about other property purchase costs? How difficult is the property purchase process in Bermuda? To buy property, one has to obtain an Acquisition License from Bermuda´s Ministry of Labour and Home Affairs. The Acquisition License fee is at 15% of the purchase price for condominium units, and 22% for houses. Also, the property in question should have and an Annual Rental Value (ARV) of at least US$153,000 or greater for houses, and at least US$32,400 for condominium units. 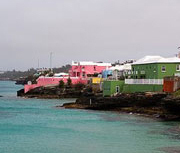 The required minimum ARV is determined, and regularly assessed, by the Bermuda Government. Property falling under this category may only be purchased by a foreigner if it is being sold by a Non-Bermudian owner. Another restriction is: interested non-residents can only acquire condominium units in "special development areas" approved for foreign ownership. Also, Non-Bermudians are banned from acquiring undeveloped land. An exemption is only given to Non-Bermudian spouses and children of Bermuda nationals. Ordinarily, the Bermuda Government requires purchases of real estate by Non-Bermudians to be in the name of an individual or individuals, while foreign companies or corporations are not ordinarily permitted to buy residential real estate. Other restrictions include: not being able to rent out or sub-divide the property unless specific permission is obtained from the Minister of Home Affairs and Public Safety. Generally speaking, you cannot remain on the island once you lease your home. When a property has been chosen, and a price negotiated, a sales agreement is prepared and executed. Simultaneously, the buyer is required to place a 10% deposit which is held in escrow until the transaction is closed. After scouting and negotiating, it is necessary for any Non-Bermudian to apply through a Bermuda law firm in the prescribed form to the Bermuda Government´s Minister of Labour & Home. The consideration fee is US$1,152, which is refunded if the application is successful. Though the sales agreement entered into by a Non-Bermudian will be conditional upon the grant of the purchaser´s license to acquire the particular property, the consideration fee is a cost incurred should the application be denied. The Bermuda Government approval process may take anywhere from two to six months. Once approval has been granted for the purchase, the fee (22% of the estimated ARV) is paid by the purchaser and the license is released. While applying for the license and waiting for its approval, the transfer of property will proceed, and the lawyer will do a title search. When all the conditions of the sales agreement have been met, the Planning Department will do a search to determine if any illegal development has taken place on the property being acquired. This usually takes a month or so. Make sure that this search is completed before the transaction is closed, because once the property is in the buyer´s possession, the buyer becomes responsible for it. Bermuda uses Bermudian Dollar, which is pegged to the US dollar at 1:1. The property is in the City of Hamilton, in the main island of Bermuda. The Acquisition License fee is 18% of the purchase price for condominium units, and 25% for houses. Stamp Duty is typically divided equally between buyer and seller, but can paid by the buyer or seller alone depending upon negotiations. It is charged on a sliding scale based on property value. Legal fees are generally minimal, and are set by the Bermuda Bar Association. The rate is 1% for properties worth US$500,000, and decreases up to 0.125% for properties worth at least US$2 million. It is typically divided equally between buyer and seller. The Real Estate Division of the Bermuda Chamber of Commerce recommends 5% real estate agents´ commission. How landlord-friendly is the law in Bermuda?